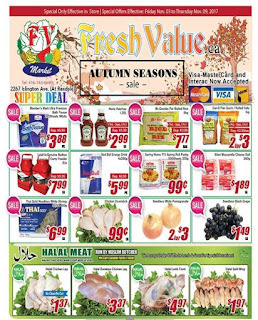 Fresh Value Ontario flyer, November 3 - 9 , 2017, Member's Mark Ultra Premium Bath Tissue $6.99 Regular Price $3.88 pk Sale Price 265 sheets. 9 rolls. Heinz Ketchup $5.99 Regular Price $2.99 Sale Price 1.25 L. Fri.- Sun only. 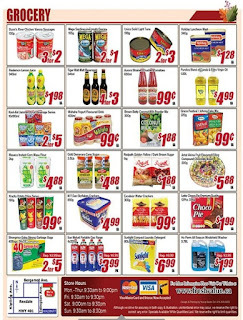 Mr. Goudas Par-Boiled Rice $11.99 Regular Price $7.77 bag Sale Price Fri.- Sun only. Dan-D Pak Quick Rolled Oats $2.99 Regular Price 2 $3.00 Sale Price 1 kg. Fri.- Sun only. Lalah's Genuine Madras Curry Powder $9.99 Regular Price $7.99 Sale Price 3 lb. 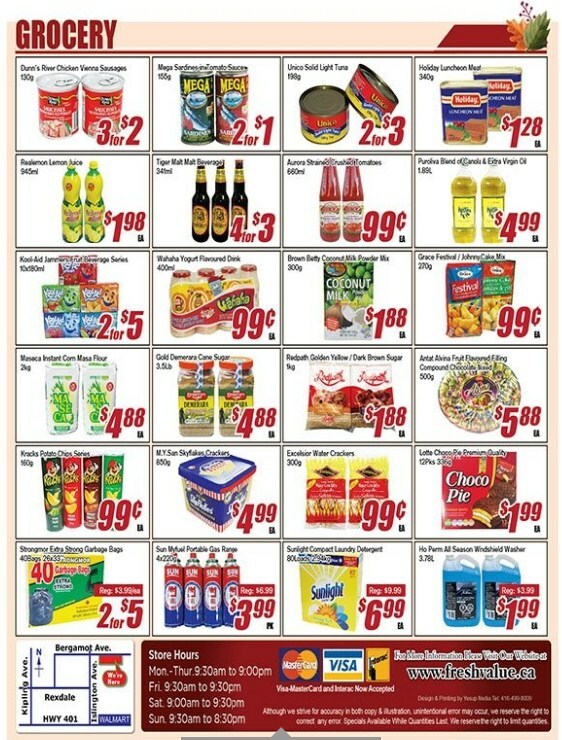 Red Bull Energy Drink $8.99 Regular Price $5.99 pk Sale Price 4 x 250 g. Spring Home TYJ Spring Roll Pastry $0.99 Sale Price 200 sheets. 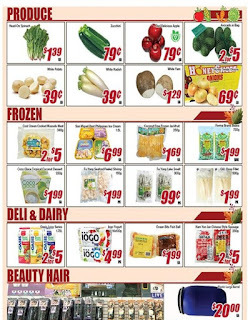 275 g. Silani Mozzarella Cheese Ball $1.89 Sale Price 260 g. Thai Gold Headless White Shrimp $6.99 Sale Price 40 50, 400 g. Chicken Drumsticks $0.99 lb Sale PriceSeedless Black Grape $1.49 lb Sale PriceHalal Chicken Leg $1.37 lb Sale Price No clean no cut. Halal Boneless Chicken Leg $3.37 lb Sale PriceHalal Lamb Front $4.97 lb Sale Price. Halal Split Wing $1.97 lb Sale PriceSoup Combo $3.99 combo Sale. Price Get a free soup with the 3 items combo. Cantonese Noodle $2.99 Regular Price $1.99 Sale PriceChicken . 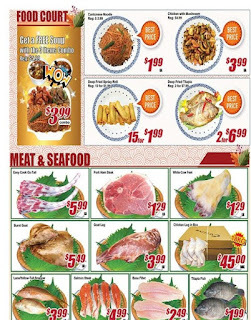 With Mushroom $4.99 Regular Price $3.99 Sale PriceDeep Fried Spring Roll 10 $1.99 Regular Price 15 $1.99 Sale PriceDeep Fried Tilapia $7.99. Regular Price 2 $6.99 Sale PriceEasy Cook Ox-Tail $5.99 lb Sale Price. 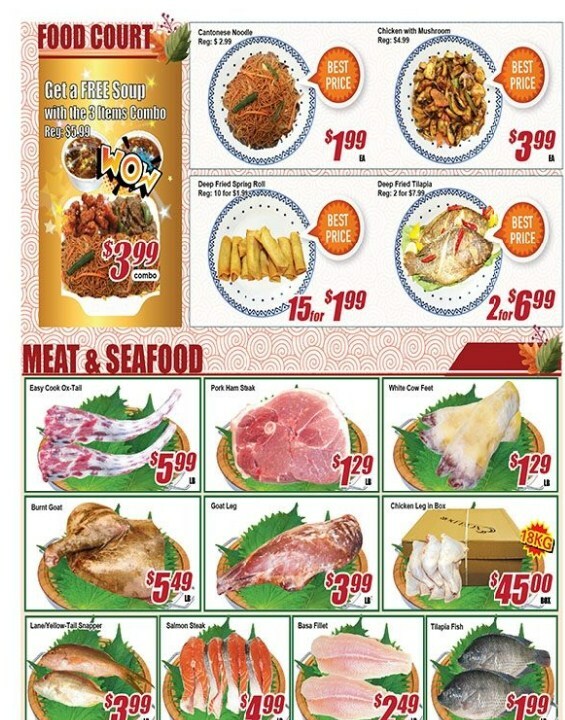 Salmon Steak $4.99 lb Sale Pric Basa Fillet $2.49 lb Sale PriceTilapia Fish $1.99 lb Sale Price.